Dallas Arboretum And Botanical Garden August Dollar Days! You are here: Home / Dallas/Fort Worth Events / Dallas Arboretum And Botanical Garden August Dollar Days! With the temperature on the rise, people are looking for cool places to chill in Dallas. 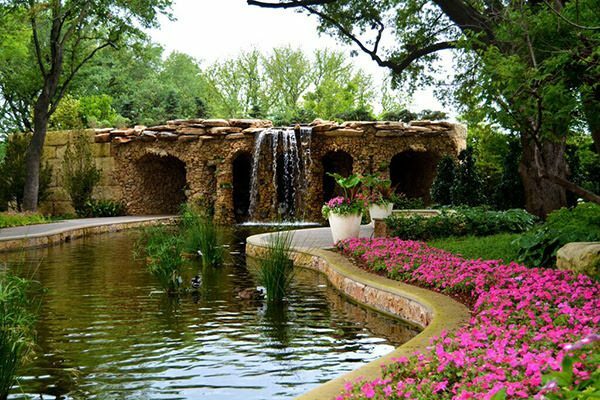 The Dallas Arboretum and Botanical Garden recommends several places in the 66-acre garden for staying cool, while enjoying the Texas summer. Just this summer, Forbes Travel Guide named the garden ‘The Best Ways To Do Dallas Outdoors’. “Timing is perfect for visiting the Dallas Arboretum this summer as we will offer August Dollar Days, presented by Time Warner Cable, with significant savings for guests,” said Bill Graue, Dallas Arboretum chairman. The garden will offer $1 general garden admission and $2 Rory Meyers Children’s Adventure Garden admission to all guests during August. There will also be select $1 and $2 food items throughout the gardens. As a part of its Connect a Million Minds Initiative (CAMM), Time Warner Cable partners with the Dallas Arboretum to provide August Dollar Days to the general public and to support after-school STEM (science, technology, engineering and math) activities as it applies to science and nature. On Saturday, August 15, it’s Time Warner Cable Day at the Dallas Arboretum. From 9:00 a.m. to 2:00 p.m. in Rosine Hall, paid garden guests will have the opportunity to participate in hands-on STEM activities. Kids and the young at heart will explore fun STEM activities designed to stretch their imagination. The Rory Meyers Children’s Adventure Garden has more than 8,000 square feet of misting throughout the entire eight-acre garden, so there are cool places throughout to beat the heat. Plus, the theme of this garden is water, so there are plenty of areas with water including the waterfall and entry area with fountains. This summer, the most popular area is the entrance where the vertical water fountains spray periodically as children frolic in this area and enjoy getting wet. Another popular area is Energy Island where visitors can learn how to harness water, wind and sun and turn it into electricity with the interactive exhibits featuring water. Children and adults can shoot water pistols, turn cranks and move water up in Archimedes’ Screw. In First Adventure, an area dedicated to children six and younger, there are mushrooms that “sprout” water along with a small Turtle Creek River. After playing outside, guests are invited into the 9,000-square-foot indoor Exploration Center to watch an educational video in the 3-D Mini Theater, explore CSI games, perform experiments at the Plant Lab, and learn about space and weather with one of the few OmniGlobes in Texas. Cool off with a stroll in the misters of the Palmer Fern Dell as it’s usually five to 10 degrees cooler in there. The shade of the Pecan Grove is a great picnic area and features four Texas-themed topiary flower houses. On Friday, July 31, join us for our last Family Fun Fridays there with a petting zoo, nature crafts and face painting. Stop in and cool off in the ever-popular Toad Corners. Visit the newly opened Lay Family Garden with its new 12-foot waterfall and grotto. Sit behind this waterfall in the shaded and cool grotto for another view of the garden. August Dollar Day tickets are available for purchase only at the gate. Parking is available for a discounted $8 ifpurchased online in advance. For more information on August Dollar Days and other daily activities, call 214.515.6500 or visit www.dallasarboretum.org.